Portrait photography is not my forte. I’ve been taking serious photos (with a now 10 year old Canon) for only four years. I’m learning as I go; I have no teacher/mentor. I started out taking indoor photos of items selected from my collection of old/vintage folk art and collectibles. Then, I started venturing around my neighborhood to take photos of houses and buildings. The next step was to visit some of the fabulous parks I’m fortunate to have within walking distance. (I walk and bike; I do not drive.) The parks around here not only have beautiful evergreen and deciduous trees, which make great photo ops; they also have spectacular views of my city: Seattle, WA. And one of the parks stretches out along our waterfront. 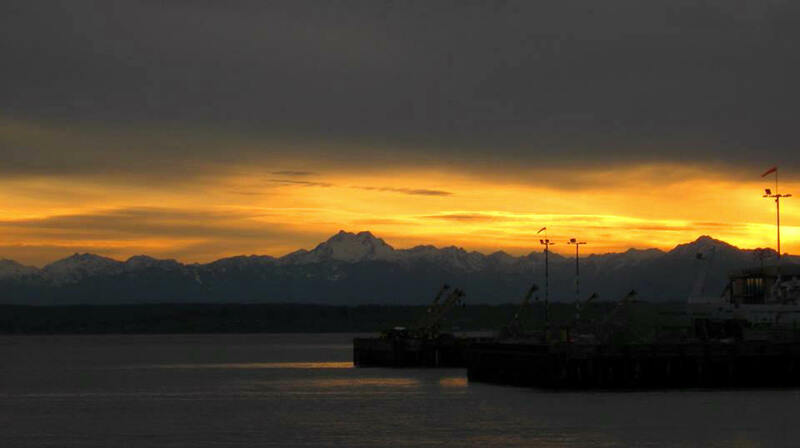 I can walk 10 minutes, and then, wade into Puget Sound. Except that I don’t — the water is too cold. But I could…. Anyhoo, as they say, the last thing for me to do, photography-wise, was to start shooting photos of people. I had to overcome my natural shyness, in order to ask people to pose for me. I found a subgroup of folks who are easy to approach, and more than willing, in most cases, to pose for me. And they are the skaters. This is the first skater photo I made. I had just discovered that my camera would shoot in b&w mode. I was strolling around Seattle Center, taking photos of the iconic and now historic Space Needle, and Pacific Science Center arches. As I was shooting the arches, I noticed a skateboard park had been constructed, just a little ways away. I walked over and watched some young people enjoying themselves with their boards, traversing up and down the ramps and railings. I decided to try some action photography. I caught a few skaters in action; but looking at my little display screen, I could see that all I had captured was blurs. So, when this fellow stopped to catch his breath, I called out to him, and told him I was trying to learn b&w photography. I asked him to let me take his photo, and he acquiesced. And, I got this: the first good photo I’ve ever taken. Thank you, skater dude. 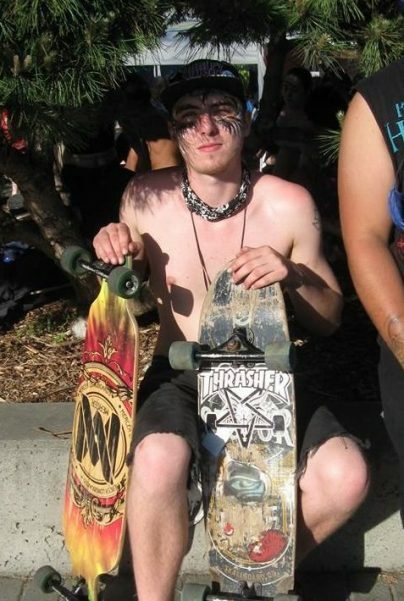 I’ve actually had a soft spot in my heart for skateboarders for a long time. 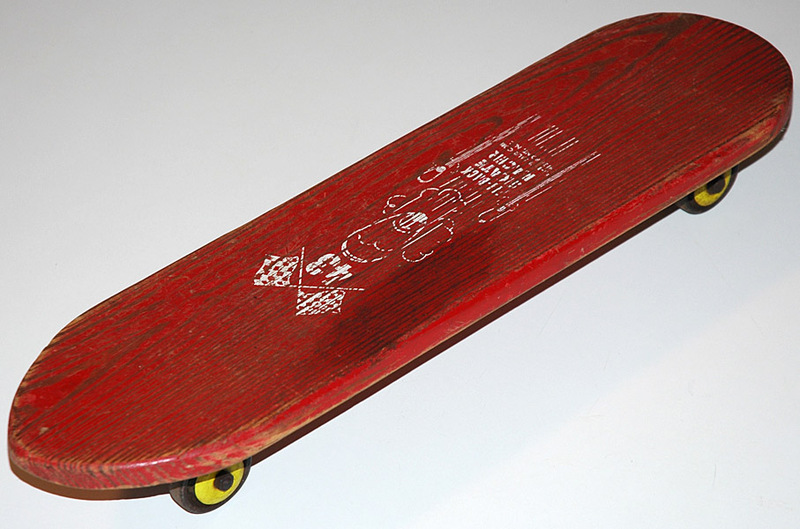 To begin with, I had my own board, circa 1961, growing up in Yakima, WA. 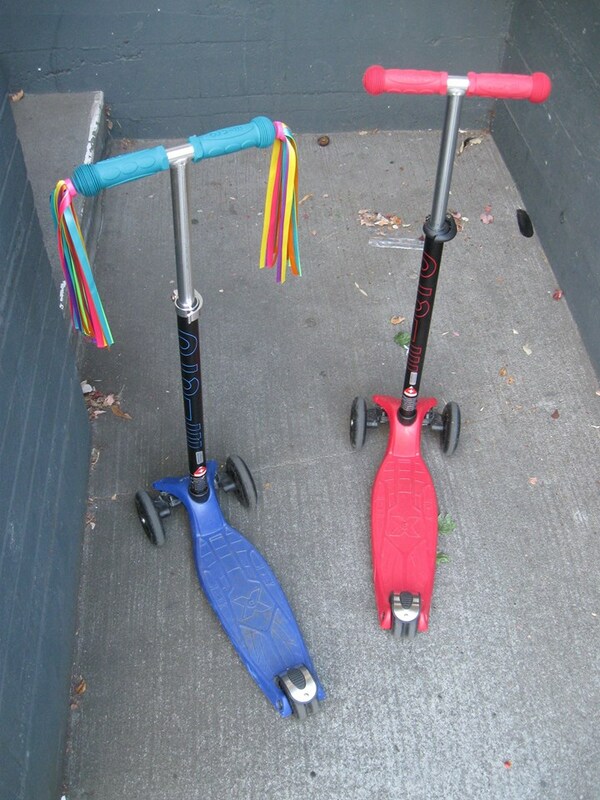 I remember riding my board all over the breezeways of Central Catholic Church, and its school, Carroll High. There were cement pathways all over that place. I got to where I could go pretty fast; I got to where I could stay steady on the board, and not fall off. But I wasn’t doing any tricks. I didn’t know anyone who did tricks. We just rode around, skimming over the concrete “waves”. I loved doing this. I’ve always preferred traveling under my own power; skateboarding is a great example of this. Your basic 60’s board. Primitive wheels, basic ornamentation. Like one I had. Also, and this just tickles me: I started the Velvet Illusions, a teen rock band, in 1966. Over the course of two years, we recorded ten songs, in Seattle, and Hollywood, CA, which are now cult faves. — You can hear all of them on YouTube. And, that’s due to a lot of young people finding our songs, and making videos with them. 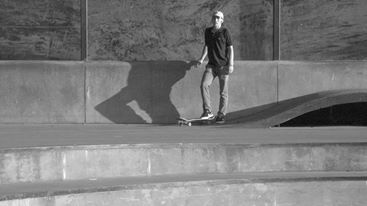 Eugene, Oregon skateboarder, Mr. Hunter Harper, is among those who’ve incorporated our music into skating videos. I was blown away when I found his Element Flatbar Sessions vid, which featured our iconic song, “Acid Head”. It took a while, but I was able to track the talented young man down; and now we’re pals, via Facebook. Please be sure to play his videos, which I’ve embedded at the end of my story, along with a another one created by a Minnesota skateboard dealership. So yes, I’ve always felt a kinship to young skaters. I appreciate their independent ways. They don’t go with the flow; they make their own. So, when I’m out and about, and I see them, I usually ask skateboarders to pause for a moment, so I can snap their photo. I encountered this fellow at the NW Folklife Festival. He proudly displayed two boards. As you can see, skaters like to decorate their boards. It’s as much an artistic expression as it is a sport, as it is a mode of transportation. Of course, skaters love to do moves and maneuvers with their boards. They have names for any number of impressive, athletic, precision moves. I bumped into this team on Seattle’s Lower Queen Anne, and noted their sturdy helmets and long pants. — When you are executing the kind of moves these young people do, falls and spills can happen. And this group was prepared. Seattle’s sister city, Kobe, presented us with an amazing bronze bell, called the Kobe bell. It’s housed in a beautiful wooden shelter at Seattle Center. 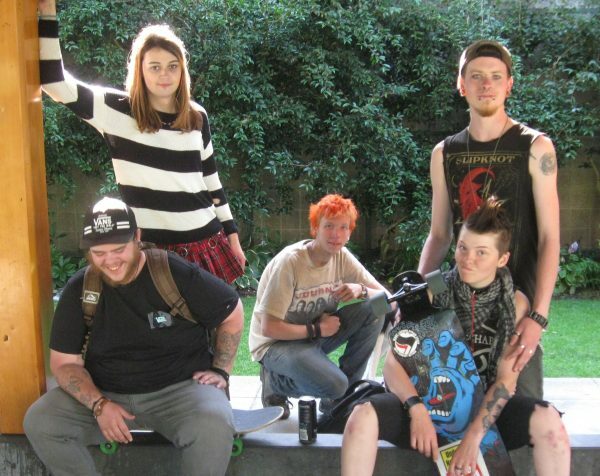 Last summer, I went there to photograph the bell, and I found this amazing group of young people, sitting under the bell. They were listening to music, smoking, drinking energy drinks, and just generally enjoying themselves; bothering no one. I spent a good half-hour visiting with them. They were great fun; super interesting. We hit it off; I wanted to cast my fate to the wind, and sign on as a member of their crew. — But I have my own life to lead, with my Katgrrrl, in our little senior citizen’s apartment. Before we parted, I got this shot. I thanked them, and then advised them, “Don’t take any sh*t off of grownups!” They all laughed. A woman, her board, and her man. 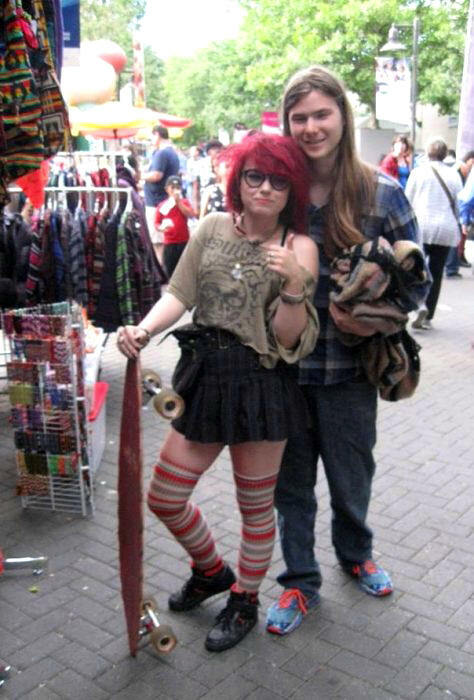 Street fairs and festivals are great places for people watching. I ran into this beautiful couple: a young woman and her man. Yep, the board is hers. They were very happy to pose for me. Her coiff certainly adds a pop of color to my story! 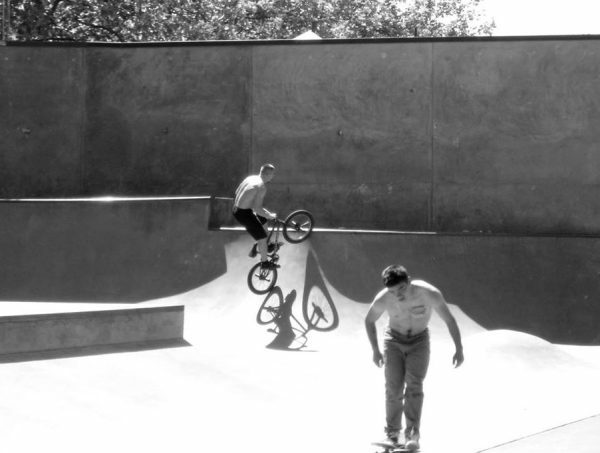 While the skateboarder hurriedly skated away, this dude on a bike executed a trick. Man, if I tried that, I’d definitely be sporting a helmet. Anyway, luck was really with me. I managed to capture the shot right when the sun made the rider and bike cast an amazing shadow. — Another photo I’m really happy with. — Not sure how the skaters felt about having this guy on their turf. I’ve boogie-boarded on surfing beaches, and some board surfers were very aggressive about signaling their displeasure with our presence. That is, they’d practically ride right over us. The skaters, on this day, seemed not to be bothered by the biker’s presence. Perhaps he was a friend. And then, there are scooter kids. Seattle is so fortunate to have The Maldives, a great alt-country band. People often line up to see and hear them play their engaging music. In August, I went to see them play a KEXP Radio concert at our famous Mural Amphitheater (I’ve been fortunate to play shows on its stage three times, myself). 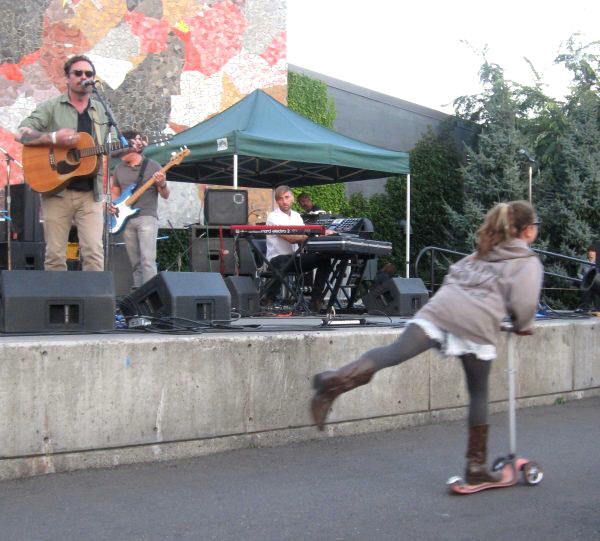 During their performance, this spunky girl scooted right past them, totally oblivious to their music. I just had to laugh. — While I was taking this shot. This was the best I could do — I didn’t know she was coming! I saw these beauties parked by an Upper Queen Anne apartment, just waiting for their young riders to come and take them on their next adventure. That’s what the young do: they go on adventures. Let’s encourage them to make, and take, their own path. Go skaters! 8/11/18 update: earlier this week, I was on my bicycle, at an intersection, waiting for the light to change. A group of skaters crossed the street in front of me. One of them saw me, and his face lit up. He gave me a very friendly hello and a wave. I started laughing. The rest of the bunch turned and looked, and they all said hello! I said, “You recognized me!” And then, everybody laughed. 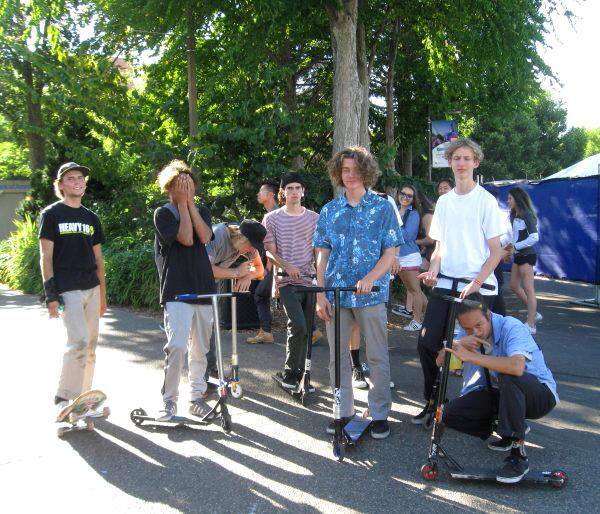 I encountered another group of excellent young gentlemen, at The Bite Of Seattle in July. They were happy to line up for this shot (well, one was a bit shy). Nice pics, Randy. Great story, too. Here’s the direct link to your other story: https://randybowlestories.wordpress.com/2014/10/09/boogie-boarding-as-a-metaphor-for-getting-out-and-doing-it-again/ I easily found it by doing a search at the top of your blog. No need to use Google and one should never use it for doing a search since they are engaging in censorship and manipulation of search results. Try DuckDuckGo, https://start.duckduckgo.com/ instead. Thanks, Lo. Well, when I put a direct link in, which I know is very easy to do, then I get ping-backs or something that I have to deal with, and it gets tedious for me. I don’t know how to put it in words — what happens, what the process is; but something about it seems complicated. Feel free to try to explain it to me. 😉 I think I tried DuckDuckGo before. I’ll give it another try. A lot of people who read my blog stories don’t seem to figure out that I have 150 other stories, and don’t know how to search. Mine are one of the only blogs they ever seem to visit. (?) So I spell out the search words. But I would prefer to have the link in there, as you suggested. Re the story itself, twice in the middle of the night, I’ve had bursts of creativity happen, where I had to get up and take action. I wrote a song; and the idea to put all of my skater photos into a story came to me. So I have two bigger creative achievements this week. I’m a happy guy! I won’t have a gig to sing my song at until who knows when; but on New Year’s Eve, I played to 1,500 people! They were mostly young people from all over the planet. I was just blessed. They loved it; I loved it. I did What’s So Funny About Peace, Love and Understanding. Wonderful that you had a gig for such a huge crowd! to use your music to perfectly enhance his video! Thank you newscat! I love young people, and it’s great fun to have a two-way thing going here. They like my music, I like their creativity and lust for life.